Gujarat is one of the most diverse states in India. There are various temples in Gujarat. 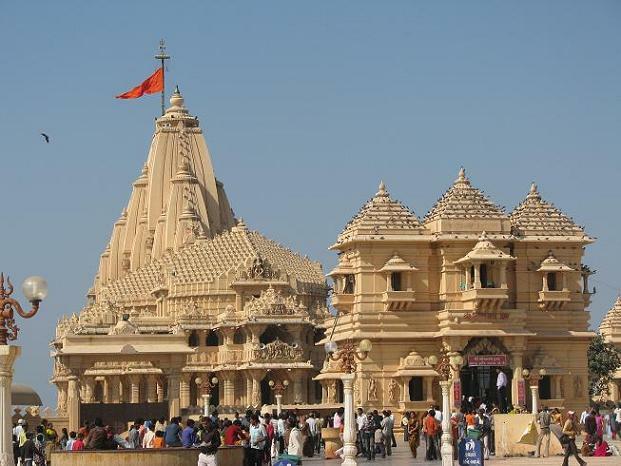 The famous temples in Gujarat are the Dwarkadhish, Somnath temple and the Akshardham temple. The Gujarat temple tour will take you to these famous temples in Gujarat. Dwarka is known all over the world for the temple of Dwarkadhish, the 'Lord of Dwarka', also known as the Jagat Mandir or temple of the world. This temple is dedicated to the Lord Krishna. Another famous temple is the Somnath temple. This temple is one of the twelve most sacred shrines dedicated to the Lord Shiva and a jyotirlinga. In the morning arrive at Rajkot airport. Upon arrival, you will be met by our representative and drive to Dwaraka. In the evening arrive in Dwaraka and drive to the hotel. Dwaraka is situated on the Saurashtra coast, where the River Gomti meets the Arabian Sea. According to the legends, Dwaraka was once the capital of the Lord Krishna's empire. Dwaraka is known all over the world for the temple of Dwarkadhish, the 'Lord of Dwarka', also known as the Jagat Mandir or temple of the world. Later in the evening we visit the temple and take part in the Aarti. In the morning we visit the Dwarkadhish temple. This temple was constructed over 1400 years ago and houses the image of Lord Krishna. This temple attracts pilgrims from all over the world. Besides the Dwarkadhish temple there are various other temples in Dwarka. After visiting the temple we drive to Porbandar. Porbandar is a picturesque old sea port situated on the western coast of Gujarat. Porbandar was the birth place of Mahatma Gandhi. In the morning we visit the Kirti Mandir or the Gandhi home in Porbandar. In this home the Mahatma Gandhi, the father of the nation was born in 1869. 17 rooms and three storeys are there in this house. After visiting the Porbandar we drive to Veraval and have overnight stay at the hotel in Veraval. In the morning we drive further to visit the legendary shore temple of Somnath. This temple is one of the twelve most sacred shrines dedicated to the Lord Shiva and a jyotirlinga. According to the legend, Somnath temple was built originally in gold by Somraj, the moon god. This Somnath temple was rebuilt and destroyed seven times till 1706 when it was raided by the Mughal emperor Aurangzeb. After that it was finally rebuilt in 1950 with the support of Sardar Vallabh Bhai Patel. The current temple was built to traditional designs on the original site by the sea. Today we drive to the Rajkot airport to connect the flight for the onwards journey.